Are the Causes of the French Revolution Present in the US Today? There once was a time when the wealthy upper class and the Catholic Church didn’t pay anything to the government in terms of taxes and had special socioeconomic privileges. It would fall upon the largest class of citizens, the peasantry to pay taxes and keep the coffers of the country full. I’m talking about pre-revolutionary France but the description of that society would almost tend to describe the way U.S. society is currently. The wealthy of today are generally considered the one percent. Though they do pay taxes, many people still consider the system to be unfair. Though the wealthy pay more in taxes than the average citizen in terms of dollar amount, it is the overall percentage of their income that is significantly lower. They use offshore bank accounts and tricks written into the tax codes specifically for them to pay a lower percentage and to even avoid paying federal taxes on some of their income. Billionaire Warren Buffett brought this topic into the political spotlight in 2012 when he announced that it was unfair that he paid a lower percentage in taxes than his personal secretary. There have been calls for an overhaul of the tax code, but Congress has been in no hurry to act. The IRS though has begun to crack down on those who have foreign bank accounts and are not filing appropriate tax returns on the money that is contained within them. Though we can trace back the religious exemption, it hasn’t always been accepted. James Madison, for instance, opposed tax exemptions for religious institutions. Religious tax exemptions are seen as a privilege and not a right as they are granted by the government because of the positive contribution religious institutions are presumed to make to society. A 1954 law bans political campaigning by tax-exempt groups which does include religious organizations. It should come as no surprise that there are several religious organizations that defy this law, including the Church of Latter Day Saints’ work to pass Proposition 8 in California. However, none of these organizations have lost their tax-exempt status. This is the bulk of society, yet it is the part of society that often feels as though it is left out and not heard. Even in pre-revolutionary France, the nobles (the wealthy) and the Church would often vote as a bloc to overrule the Third Estate (the commoners) though they had the largest delegation. What was then called the Third Estate can now be termed the working class. Today, the working class doesn’t feel as though its elected leaders are working for their best interest or hearing their concerns. It is often felt that the working class bears the tax burden of the country. In the 2014 legislative session in Missouri, lawmakers approved a reduction in the state income tax, but are now asking residents to approve a sales tax to fund transportation/infrastructure projects. Both actions are largely seen as a benefit to the wealthy while placing a heavier burden on the working class and the poor. The taxes part gets a bit complicated and murky, but Politico does it’s best to explain it in better detail. On top of paying income taxes, the working class must also pay payroll taxes which are used to fund Social Security and Medicare. In 1789, there were two main powers: Britain and France. At the end of the Seven Years’ War (1756-1763), both England and France were broke. To solve the problem, Britain attempted to levy taxes on its American colonies which led to the American Revolution. Even with the coffers dry, France still entered the American Revolution on the side of the colonies. It wasn’t because the French monarchy believed in the liberty the American colonists were fighting for but rather to humiliate Britain. French forces were spread throughout the world to protect their overseas empire as our forces are spread out in a similar fashion to intervene wherever it is needed to protect American interests. Our military industrial complex that President Eisenhower warned in his farewell address in 1961 is still growing and becoming even more powerful and costs our nation a lot of money to maintain. According to the Center on Budget and Policy Priorities, the US spent 19% ($643 billion) of its budget on defense in 2013. There were a lot of factors that led up to the start of the French Revolution… more than what I’ve gone into here. But an underlying theme does still present itself. The bulk of the population, the working class, is feeling as though it’s paying more than its fair share and being asked to bear more and more of the burden while the wealthy get off and religious institutions are exempt. But is there a possibility of the US erupting into a French-styled revolution? Despite the vast similarities that have been described, our societies are very different. We do not live under a monarch. The President is elected every four years and can only serve 2-terms, and we do have a representative body of our government that we elect. Though we feel as though our voices are largely ignored, we do have ways to fight for change within the process… something that the people of France didn’t have. But we must remember those causes for they should not be ignored. When the vast majority of people feel as though they are being taken advantage of, they will institute change. First they will try through the democratic processes that we are accustomed to, but if that doesn’t work, I wouldn’t put it past any society to rise up against their oppressors. Afterall, we, as Americans, have already done it once before. 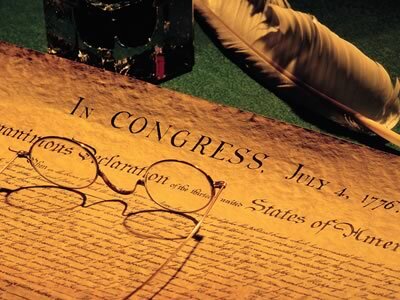 A weird coincidence happened on July 4, 1826… the fiftieth anniversary of the Declaration of Independence. Both Thomas Jefferson and John Adams died. They were two of the last three of the signers of the Declaration. Jefferson had been in and out of consciousness for days. Each time he would wake, he would ask if it was the fourth yet. When he was told that the day was finally there, he quietly slipped away. In Massachusetts, Adams had started the day like any other. He was well aware of the significance of the day, but being in his 90s, he had refused to attend any public ceremonies. Sometime around midday, about the time that Jefferson passed away, Adams’ health took a turn. He would go in to rest, but his health continued to deteriorate quickly and the family gathered by his bedside with the exception of his eldest son, John Quincy Adams, who was President and was attending official ceremonies in Washington. Just before he passed, Adams spoke his final words. “Thomas Jefferson survives.” Unlike today, news didn’t travel very quickly, and there was no way for him to know that Jefferson had died hours before. Adams would mutter something inaudibly and then closed his eyes. It signified the end of a chapter of American history. The two last giants of the revolutionary era were gone in a single day… and on the most significant of days. Both had served in the Continental Congress, both had served on the committee to draft the Declaration of Independence (it was Adams who insisted that Jefferson write the Declaration), both had served as ministers overseas… both to France at one time before Adams was transferred to England, both would serve as Vice-President after the Constitution went into effect (Adams under Washington and Jefferson under Adams), and both would eventually be elected President. They became bitter enemies during the years of the Washington administration up through Jefferson’s own administration. They had ended up on opposing ends of the political spectrum. However, at the urging of a mutual friend, Dr. Benjamin Rush, both recaptured their friendship through a correspondence that still stands the test of time today. Here were two men who were great friends, became bitter rivals (Adams didn’t even attend the inauguration of Jefferson in 1801), only to recapture that lost friendship again… which would last until their dying day. Jefferson is correct in that aspect. As much as we detest the political parties of today, it would foolish of us to think that society does not devolve into them. We all tend to group with people that think like we do. We may not all agree on everything, but for those important things than we do (core values), we tend to form some sort of party around. Even as independents, we tend to group ourselves together, spark debate, bring about compromise or entirely new ideas. In the end, we can still be the same as a political party. We just try to allow ourselves more political freedom instead of adhering to one political ideology. In a letter dated November 13, 1815, Adams wrote to Jefferson, “The fundamental article of my political creed is that despotism, or unlimited sovereignty, or absolute power, is the same in a majority of a popular assembly, an aristocratical council, an oligarchical junto, and a single emperor. Equally arbitrary, cruel, bloody, and in every respect diabolical.” Essentially, the republican form of government belongs to the people but it can degrade into despotism if the people become complacent instead of forcing the government and those that we elect to it to high standards and to uphold the law of the land (the US Constitution). In our modern times, we have become very complacent and seem to turn a blind eye to our elected officials when they violate the Constitution. That complacency just tends to build up more and more, and our elected officials aren’t being kept in check so they are ruling however they so choose. Working together is no longer a way to get things done. They have a “my way or the highway” attitude about them, and they will bring down the government, the economy, the entire country until they get what they want. Either they do not care of the consequences of their actions (or inaction) or they are completely unaware. And as much as we like to blame Congress for the problems and their inability to solve our problems or get anything done, but we are still the ones that continue to elect them regardless of what they are doing… or not doing. As we celebrate this Independence Day, let us also declare our own independence… not from the political parties that we have grown to detest, but rather from our own complacency. We are the ones that must restore order where chaos had ensued. Even despite all the money that is spent on elections now, we are still the people, and we still have the final say. Jefferson wrote in his Notes on Virginia, “Every government degenerates when trusted to the rulers of the people alone. The people themselves are its only safe depositories.” But we the people must stand up for the rule of law and for liberty for all. We cannot do so if we are complacent and allow our government to run amok. These two men, who we now see as larger than life, were anything but complacent. They stood up to their government and even helped to declare independence from said government when it was no longer representing them. They worked to secure that independence and establish a new nation… depending on citizen involvement and republican ideals. And throughout these turbulent times, they believed in the rule of law above all others. In his notes for an oration he would give in Braintree in the Spring of 1772, Adams wrote, “The only maxim of a free government ought to be to trust no man living with power to endanger the public liberty.” We should always be aware of the actions of those we elect to government. They should realize that upholding the law is second to none. The “Spirit of ’76” doesn’t just belong in our history books. It is something that we must continually practice so that our government does not devolve into the very thing we sought our independence from.